I have been playing with my new serger. 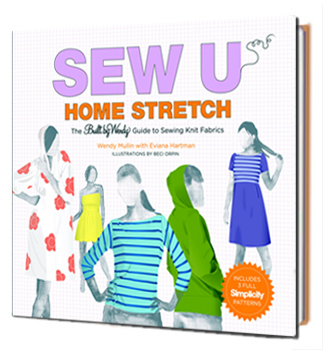 My serger came with instructional DVDs but I also wanted to learn more so I turned to the book Sew U Home Stretch by Built By Wendy. It comes with three basic patterns and ways you can tweak them to make other things. I was feeling very adventerous and made my first t shirt. I used a rayon/poly knit from Fabricland, and the Built by Wendy t-shirt pattern from the book. I cut a scoop in the neckline added the four inch drapy collar and 11 inch sleeves. It came together very quickly, and I think it looks at least as good as something from Old Navy. (I'm twisting in the picture). I need more basics like this for winter so I will sure to make more. Serging looks scary but it's fun. Your top looks gorgeous and fits you nicely. Nice shirt!! I love your skirt, too! This looks fabulous! That neckline is excatly what I'm looking for and I've been Googling to see if the pattern is in the book. Sounds like you altered it yourself- how did you do it?